Besides being a great conductor of heat, lasting a lifetime, being an heirloom to pass down to your kin, cast iron cookware takes muscle to lift, and that’s a good thing. Cast iron is very heavy. If you’re a fitness buff, who appreciates home-cooked meals, then you ought to look into buying cast iron cookware. Start out by purchasing a small 8″ skillet to learn how to cook, and care for cast iron. If you decide you really enjoy using it, then branch out into a larger 10 or 12 inch skillet, or even a dutch oven. Cast iron cookware helps to strengthen forearm muscles, biceps, and fingers. It’s not for sissies, that’s for sure. 5 Quart Dutch Oven and lid weighs 14 lbs. 12″ Skillet weighs 9 lbs. 8″ Skillet weighs 4 lbs. Less expensive than stainless steel. Non-toxic surface offers a healthier alternative to non-stick cookware. Multiple uses from stove top, oven, grill, and campfire. Very sturdy. Outlives other types of cookware. Excellent heat retention and even heating. Interested in learning more about cast iron cookware? Just click this link. Ready to buy? 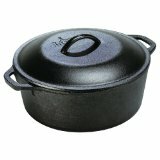 This link will take you to Amazon, where you can browse a wide selection of cast iron cookware, or buy the Lodge 5-Quart Dutch Oven with Loop Handles as shown in the photograph atop this post. Posted on November 28, 2012, in Food, Recommended Products and tagged cast iron cooking, dutch oven, non-stick surface, non-toxic cookware. Bookmark the permalink. Leave a comment.